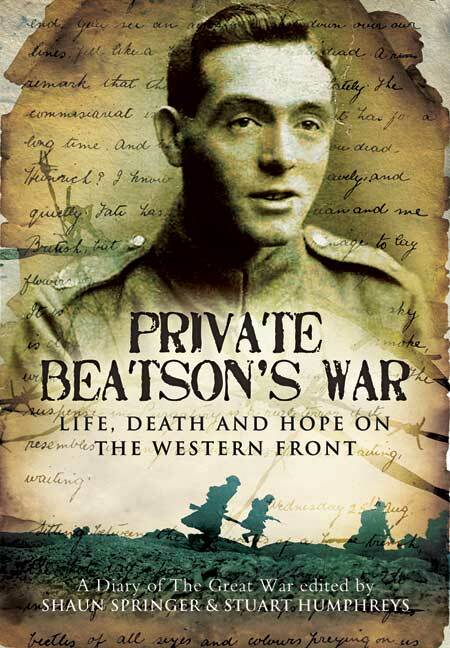 You'll be £4.99 closer to your next £10.00 credit when you purchase Private Beatson's War. What's this? Until recently James Beatson was one of the millions of forgotten soldiers of the Great War. But after 90 years his diary has been rediscovered, perfectly preserved, and his story can now be told. It is a moving, intensely personal and beautifully written narrative by an extraordinary young man who witnessed one of the darkest episodes in European history. His experience gives us a telling insight into the thoughts and reactions of a self- educated, patriotic and religious individual confronted by the horrors of warfare on the Western Front. Indeed, after reading the diary of a dead German soldier, Beatson begins to identify more with the thoughts and fears of his enemy than he does with those he loves at home. Reminiscent of some of the greatest of the First World War authors, the diary is also the record of a gifted writer whose potential was tragically curtailed. For, shortly after marrying his childhood sweet heart, he was killed in action at the Battle of the Somme in one of the many failed attacks on High Wood. For this, the first publication of Beatson's diary, Shaun Springer and Stuart Humphreys have edited and illustrated the text and provided an introduction, describing Beatson's family background and the campaign on the Western Front in which he took part. James Beatson was the eldest of nine children. He was raised in Scotland by working-class parents. He was a civil engineer until, as with so many, the declaration of war offered him the chance of adventure. He enlisted in the first days of the war in the Royal Scots and was an eyewitness to the first poison gas attack by the Germans in 1915. Despite the horrors he experienced, Private Beatson never lost his love of humanity nor his faith. He now lies buried, lost somewhere on the Somme when in July 1916 he breathed his last in that infamous battle. This is a work that will appeal to those who enjoy First World War memoirs of the men in the trenches and is of special interest to anyone connected with the 1/19th (Highlanders) Battalion... It is in Beatson's style that the diary becomes worthwhile; it is well observed and factual, but sensitive and sympathetic. James Beatson was an educated young man, who qualified as a civil engineer and found employment with Edinburgh City Council's Valuation Office. On 19 August 1914 he enlisted in the 9/Royal Scots, a Territorial Force battalion, and left for France on 23 February 1915. He served with them until late July 1916 when he was killed in the attack on High Wood; his name is commemorated on the Thiepval Memorial to the Missing. As he sailed for France, Pte Beatson started a diary which he kept regularly until he returned home on leave in December 1915. The diary was intended as a rough record of events to aid his memory in the future. He writes of his impressions of the countryside and the people, of his delight in receiving letters and parcels from home; of times spent in cafes and bars with friends and occasionally,with other nationalities including French soldiers. He understands French, and an interesting part of his diary in his analysis of the diary of a Prussian officer. It is these touches of normality that make this diary a short, but memorable portrayal of the expressions of an ordinary soldier. Many excellent photographs have been included, captioned by excerpts from the diary, and there are three relevant maps. The diary remains beautifully crafted, and sadly too brief, record of one man's experience of war. days, as befell the 9th Royal Scots in the 2nd Battle of Ypres. altogether new perspective on a dreadful passage of history. James Beatson is one of the best types of educated working-class soldier, quoting in his letters from RL Stevenson, GB Shaw, Zola...and a couple of French poets I have never heard of! He reminds us of the importance of mail and parcels from home, of the rum rations, of the constant grip of rumour, and of how filthy French trenches were. The editors have annotated the diary very well and have authenticated it carefully. All in all a useful addition to the literature of trench life in 1915. It is a moving, intensely personal and beautifully written narrative by an extraordinary young man who witnessed one of the darkest episodes in European history. This book is an astonishing window into the life of one ordinary man called upon to do extraordinary things in the worst of conditions. Sure to appeal to World War One enthusiasts, Historians and anyone with an interest in the First World War. This is a moving, intensley personal and well written narrative account by a thoughtful and religious man confronted by the horrors of war. . . Though this diary spans a relatively short period from February 1915 to 23rd July 1916- when 2024 Corporal Beatson was killed in action at High Wood- it is nevertheless one of the most gripping and engrossing diaries ever to have come to print.